Kudalai idly or Kanchipuram idly is a special type of idly that is spiced with pepper, cumin seeds and ginger. Kudalai idly batter is different from the regular idly batter. My grandmother used to make these idlies with par boiled rice though some households use green gram dhal instead of par boiled rice. When the thick batter is steamed in leaf cups (தொன்னை) it is called ‘Kudalai idly’ (குடலை இட்லி). Whereas, if the batter is steamed using regular idly mould, it is called ‘Kanchipuram idly’ (காஞ்சிபுரம் இட்லி). This idly tastes best when served with 'brinjal onion kothsu' (கத்தரிக்காய் வெங்காய கொத்சு). How to prepare the batter: Wash par-boiled rice and urad dhal separately and soak them separately in sufficient water for 4-5 hours. Grind urad dhal using the wet grinder very well till it becomes a smooth thick spongy mass. Transfer the dhal batter into a large container. Now grind the soaked rice into a thick fine paste. Transfer the rice batter to the container. Mix dhal and rice batters very well. Add salt, turmeric powder, asafoetida, pepper corns, cumin seeds and sesame oil. Mix well. Please note that the batter should be THICK. Allow the batter to stand overnight or at least eight hours. Wash and soak Bengal gram dhal in water for 2 hours. Drain the excess water and keep aside. Next morning, add chopped green chillies, grated ginger, soaked Bengal gram dhal and curry leaves to the batter. Mix the batter well. How to prepare idlies: Smear the idly moulds with sesame oil. Pour idly batter up to the brim in each mould. Pour 300ml of water in a pressure cooker or rice cooker. Steam the idlies for 5-7 minutes. Once the idlies are cooked, the steam will smell of idly flavor. Switch off the stove and remove the idly mould. Allow the idlies to cool for a minute or two. Remove the idlies from the mould and transfer to a hot case. Serve hot with brinjal onion kothsu. Note: You may test if the idlies are indeed cooked by using a wooden tooth pick. Wet the tooth pick and drive it through the idly in the mould. 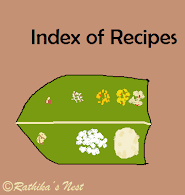 If the idly is cooked, the tooth pick will come out smoothly with no batter sticking on it. Note: Use the kudalai idly batter within two days of grinding. These idlies won't taste good if the batter turns sour.